Text-to-Speech Software for Linux: If you’ve been using Mac OS X or Windows Vista before, you may be a bit disappointed to learn that there’s no speech synthesizer or text-to-speech (TTS) application that is installed by default on your Linux distribution. For those of you who don’t know what a speech synthesizer is, it’s simply a computer program that converts normal language text into speech. Text-to-speech software can be of great help particularly for people who are visually impaired and those who are mute. If you’ve been looking for a free speech synthesizer for Linux, the one that I can highly recommend is a program called Festival. As described from its project website: Festival offers a general framework for building speech synthesis systems as well as including examples of various modules. As a whole, it offers full text to speech through a number APIs: from shell level, though a Scheme command interpreter, as a C++ library, from Java, and an Emacs interface. Festival is multi-lingual (currently English (British and American), and Spanish) though English is the most advanced. For more information and other options on using Festival, you can read the complete manual from HERE. KTTS has a GUI front-end called KMouth. A user can type a word, phrase, or sentences that he/she wants to hear through its input field. 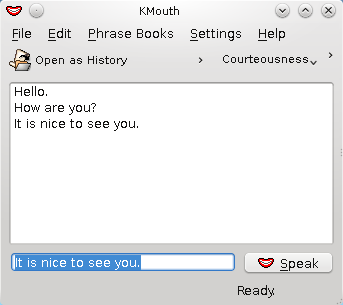 KMouth also contains a history of spoken phrases so the users can easily select phrases from the history which he/she wants to be re-spoken using a few mouse clicks. It also has a phrase book and word completion options. For GNOME users, you can use Orca’s speech synthesizer. I haven’t tried it yet so for those of you who have, please share with us your experiences of using Orca. I’ve used the text-to-speech software of Mac OS X before and I must say that it’s more functional than those we currently have for Linux. But, that’s just my opinion. How about you? How do you compare Linux speech synthesizers to those available for Windows or Mac?